Germany says the Nord Stream 2 project will mitigate declining European gas production and the possible disruption of supplies piped via conflict-ravaged Ukraine. But the plan has bitterly divided the European Union since an outline agreement with Russian gas export monopoly Gazprom was signed in September last year. Poland has been particularly hostile, and the issue has stoked tensions with Germany, already cool since Poland’s Eurosceptic Law and Justice (PiS) party won elections last October. During a day-long visit to Poland, Gabriel sought to calm Polish fears, saying he had told Moscow that Nord Stream 2 could only proceed if gas flows through Ukraine continued after its transit contract with Russia – worth about $2 billion per year – expires in 2019. Shipments to eastern Europe via the Yamal pipeline from Russia to Poland, Belarus and Germany would also be guaranteed, he said. Russia and Ukraine have been in conflict since street protests forced out Ukraine’s Moscow-backed president in 2014. Russia annexed Ukraine’s Crimea region and supported separatists in the east of the country, triggering EU sanctions and increasing anxiety among eastern European nations like Poland. 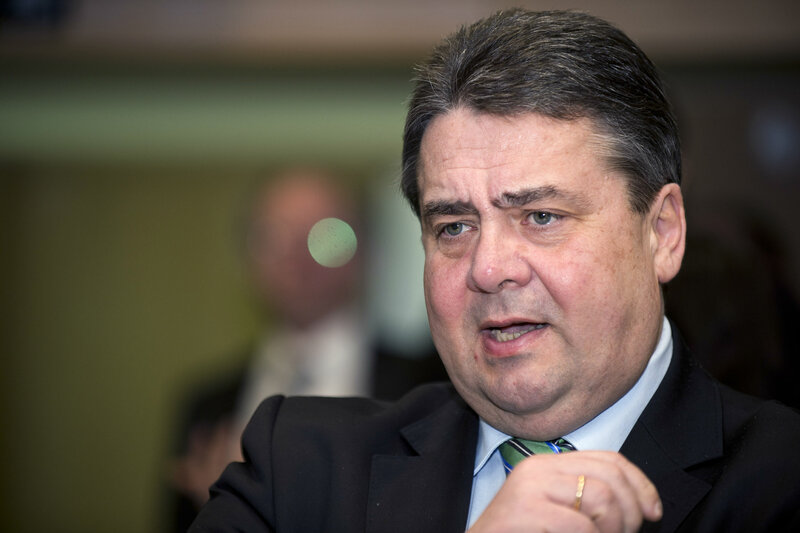 Gabriel said that the pipeline was “a business issue for Germany and a political issue for Poland”. But Polish Deputy Prime Minister Mateusz Morawiecki said it was risky to increase reliance on gas from Russia, which provides roughly one third of EU oil and gas. “We have a problem … there is a war in Ukraine, while our main trade partner is conducting talks about increasing the bandwith via Nord Stream 2,” Morawiecki said. EU regulators have yet to rule on Nord Stream 2. The European Commission is investigating whether Gazprom overcharged customers in Eastern Europe, where it supplies nearly 100% of some states’ needs. Next month, the executive will continue efforts to reduce reliance on Russian gas by proposing to increase its oversight of gas deals and improve coordination between states to counter disruption. The Commission wants access to “key security of supply gas contracts” — defined but not restricted to those which provide more than 40% of annual supplies in a member state, according to an early draft of the plan seen by Reuters. Gazprom’s agreements for Nord Stream-2 with E.ON, BASF/Wintershall, Royal Dutch Shell, OMV and Engie would likely fall under the provision. Brussels also wants to vet bilateral energy deals with non-EU countries, a move opposed by some states. Poland supports giving the Commission such powers, but Germany and some private companies, worried about commercial secrets, oppose the plan. The plan estimates Europe’s gas dependency will remain stable or grow as production within the 28-member bloc declines over the next two decades. It seeks a more interconnected energy union to let power and gas flow freely. “In the current geo-political context, such as the situation in Ukraine, the EU gas system remains vulnerable to external shocks,” the document says. Russia may revive the South Stream gas pipeline project, Russia’s Ambassador to the EU Vladimir Chizhov was quoted as saying. South Stream is a now shelved pipeline project designed to carry Russian gas across the Black Sea to Bulgaria, and via Serbia, Hungary and Slovenia, to Italy (see background). In an interview with the Rossiya 24 TV channel, Chizhov he said it was clear that in the long-term perspective the EU’s need for natural gas will be only growing. “Not that the European economy will make a breakthrough – there is no reason to talk about its rapid growth – but mainly because the production of gas in the EU will be decreasing.” “Nord Stream-2 will be [built],” – he further said, and didn’t rule out that South Stream project may be revived in the near future. Bulgarian Prime Minister Boyko Borissov said the defunct project of bringing Russian gas across the Black Sea to the EU known as ‘South Stream’ should be transformed into ‘Bulgarian Stream’, with 100% Bulgarian ownership over the pipes. The South Stream pipeline was designed to carry 63 bcm/y of Russian gas across the Black Sea to Bulgaria, and via Serbia, Hungary and Slovenia, to Italy. Its main shareholders were Russia’s Gazprom, and Italy’s ENI. On 1 December 2013, Russia scrapped the South Stream pipeline project to supply gas to southern Europe, without crossing Ukraine, citing EU objections, and instead named Turkey as its preferred partner for an alternative pipeline. After Russian-Turkish relations deteriorated over the downing of the Russian warplane at the Syrian border on 24 November 2015, rumours indicate that Russia may bring gas at the Bulgarian shore, just as under the South Stream project. With former Kanzler Schroeder in charge of Nord Stream I, Germany continues its hundreds-of-years love affair with Russia, to the detriment of its fellow members in the EU. Despite claims to the contrary, it IS a German political move and contrary to the energy policy of the European Union. But, as always, if it is good for German business, it is pushed ahead by Berlin. Even if the “business logic” becomes twisted. says Germany. And, of course we know that Russia is “the most trustworthy” entity on earth, don’t we? Don’t we? And, the recourse in the event that Russia does whatever-it-pleases will be what, exactly? Germany will pump the gas back to Russia, right? Right? Yup, German business is what German business does. And it always benefits Germany, one way or another. The same is happening with the VW scandal. Did you hear anything leading up to the COP21? Will we hear anything in the upcoming Climate and Energy Package? Well I gues as long as we have the farmers to blaim then energy and transport will be out of the focus.